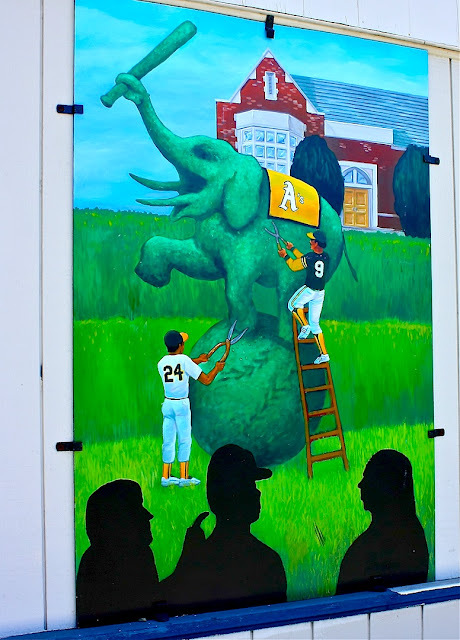 Oakland Daily Photo: Monday Mural: Go As! Several small murals now decorate the Kelly-Moore Paint Store on Telegraph and 42nd St. It's up in the air whether or not the As will stay in Oakland. So I thought I'd feature this mural before it becomes obsolete. Here's the long view of the building that serves as the gallery for these murals. These murals bring a lot of colors in the city. First one is a little crazy, the others a little bright. But all defintely would make me stop and linger awhile, and maybe even go inside the shop! The first thing is indeed the colors. They jump really of the wall and I like the trimming of the elephant great one. Placing murals on the wall of a paint store is an excellent location choice. The A's take 3 in a row from my Sox. Can you say downhill spiral? These are fun, and great idea that they are on the side of a paint store. I especially like the first one, with those silhouttes. Thank you for sharing with all of us. I must say your monday meme is one of my favourites. I had no idea that there was talk that the A's might leave Oakland!! I don't follow baseball, so was also unaware of their impending move. I think it is always sad when a team leaves - more business than loyalty.